Nowadays, the Internet is full of so-called examples of a thesis. In fact, students can even buy an entire dissertation from various websites what sell pre-written academic content. You know what the problem is with all these services? The problem is that students don’t get the quality they need. You probably realize that writing a thesis takes months. So how come a company can sell you a completely original dissertation in just 3 days? There are many scams online, and this is one of them: to trick students into purchasing theses thinking that they are original. The best way to make sure your dissertation is original and of high quality is to write it yourself. All you need is a good thesis example. By following an example, you can structure your paper properly in no time. So, to help students with dissertation writing, we have put together a brief example of how your paper should look like. You may not want to admit it, but you probably need a thesis writing service. Or, at the very least, you need a good example of how a dissertation should look like. Truth be told, very few students are excellent at academic writing. It is difficult to write a dissertation perfectly. And considering the fact that it takes months to write one, you can easily figure out why so many people are unable to submit their papers to the evaluation committee on time. When you try to look at a dissertation example online, you find only garbage in most cases. There are ads and viruses everywhere. Well, we are here to change that with this top quality thesis example! The Abstract. This is an overview of the thesis and should be between 200 to 300 words long. You are advised to write it last. The Introduction. This chapter introduces the topic, presents your thesis statement, and tell the readers more about your objectives, your research methods, and your findings. The Literature Review. This chapter presents all the information that is currently available about your topic. The Methodology. In this section, you tell your readers exactly what methods you’ve used to gather the data. Any other person should be able to reconstruct your experiments after reading this section. The Results. In this section, you present your findings and results in a clear and objective manner. Do not discuss what your findings mean. The Discussion. In this section, you get to discuss your findings and tell your readers how your research and your findings help you reach the objective of your paper. The Conclusions. This is the section where you summarize your entire thesis and provide a strong call to action. The Future Review. This is the section where you tell your readers what areas of your thesis need further research. The Bibliography. List all the sources you’ve used in your writing in this section. Make sure everything is cited and referenced properly throughout the dissertation. This short thesis writing guide is very effective because it shows you an example of just how your dissertation should be structured. You can now clearly see which sections you need and what each section is used for. 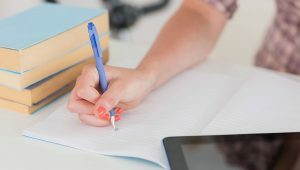 Dissertation writing is not simple, and these steps are here to provide you with just the help you need to get started and complete the paper in record time. Where to Find Other Good Examples? As we stated earlier, it is difficult to find a dissertation example that works. In most cases, you will find just plagiarized content online. Even worse, the examples you will find are incorrect and are missing important sections. Use the guide and the tips above with confidence, knowing that it was put together by expert academic writers. If you follow the best dissertation structure above, you will not get penalized under any circumstances. And if you are still wondering “who can write my thesis,” you may need to consider hiring an academic writer. If time is short and the deadline is quickly approaching, an academic writing company can help you as soon as possible. You don’t have to order an entire paper from them; you can just get some help with the thesis topics, the introduction, the literature review, or the discussion section. However, make sure you work with professionals who are reliable!